So what would you do if you had one extra day this year? I guess that's a silly question, since that day is upon us, and clearly you are blowing it reading my latest entry. But no matter how you cut it, there will be 366 days this year, rather than 365. Remember that between now and December 31st when you find yourself about to say "If I just had one more day, I'd..."
It all comes down to the fact that a full trip around the sun takes the earth 365 days, 5 hours, 49 minutes, and 16 seconds. So every four years, or thereabouts, you pick up an extra day. So we add that day, called a "intercalated" every leap year. Before the calendar was switched from Roman to Gregorian (about 2000 years ago), the lack of this "leap day" correction would cause the seasons to eventually misalign. So if you lived long enough, it would be snowing in July. Of course if you live in Vermont, that happens anyway. But I digress. So the adding of this day does create some weird situations, not least of which is birthdays. I guess it would be a lifelong icebreaker to have your birthday happen only once every four years. And you do get to pick your birthday in all of the non-leap years (Feb. 28th or Mar. 1). But those are about the only positives I can think of. Maybe that is why it is considered bad luck in some places to be born on this day. On the upside, you get a standing invitation to join The Honor society of Leap Year Day Babies, whatever that is. The chances of making this club are 1,461-to-1, which is pretty exclusive. But if you want to really up the ante, have a kid also born on leap day. Know what the odds are on that one? Try more like 2 million-to-1. And then there is the curious case of the Keough family of Ireland. The Guinness Book of World Records acknowledges this family as the only one to ever have three generations in a row with children born on February 29th. And these were not scheduled C-sections, like some people will do, but three natural births all on leap day. Of course, Ireland is one of the aforementioned places where this is not considered a good thing. Needless to say, the current generation of Keough's are hoping to have this tradition die with them. Of course there are always fun traditions that spring up around these types of events. One such example is women proposing marriage to men, or ladies' privilege. 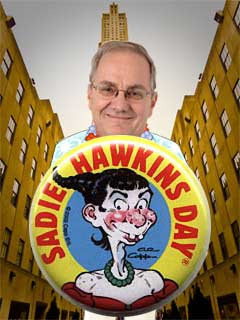 If you are as old as I am, which may not even be possible, you'll remember this as Sadie Hawkins Day from the Li'l Abner cartoon strip. Sadie was the "homeliest gal in all them hills" in the fictitious town of Dogpatch. With her 35th birthday rapidly approaching, her Dad cooked up a scheme to keep her from spinsterhood (and out of his house). He proposed a foot race between all of the eligible bachelors in town, and his daughter Sadie. He fired his gun and gave them a running start. The first bachelor that Sadie could run down, had to marry her. The lessons learned here are that homely girls are often faster than they look, and don't ever agree to marriage based on the outcome of a foot race. There is even a town - Anthony, TX - that has claimed the moniker of Leap Capital of the World. I guess they only feel like having a festival every four years. But when they do, they pull out all the stops, and this town of less than 4,000 welcomes visitors from all over the world. Most of them are born on leap day, or have family members that are. But I don't think they check IDs. You can get a timeshare rental in neighboring New Mexico and make it part of a Southwest, quadrennial getaway. Well, I am off to don my blue and yellow Leap Day clothing and poke people in eye who are not wearing theirs. What, am I really the only person left who watches 30 Rock?